Ray Walker had a secure career in finance until a wine-tasting vacation ignited a passion that he couldn’t stifle. Ray neglected his work, spending hours poring over ancient French winemaking texts, learning the techniques and the language, and daydreaming about vineyards. After Ray experienced his first taste of wine from Burgundy, he could wait no longer. He quit his job and went to France to start a winery—with little money, a limited command of French, and virtually no winemaking experience. Fueled by determination and joie de vivre, he immersed himself in the extraordinary history of Burgundy’s vineyards and began honing his skills. Ray became a pioneer in his use of ancient techniques in modern times and founded Maison Ilan. In 2009, Ray became the first non-French winemaker to purchase grapes and produce a wine from Le Chambertin, long considered to be one of the most revered and singular vineyards in the world. Along with his struggle to capture his wine’s distinct terroir, Ray shares enthralling stories of late-night tastings, flying down the Route National on a vintage Peugeot bicycle with no brakes, and his journey to secure both the trust of his insular Burgundian neighbors and the region’s most coveted grapes. 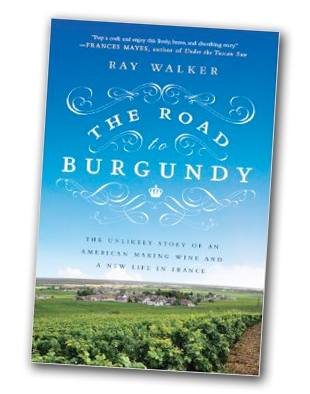 Capturing the sunlight, the smell of the damp soil, and the taste of superlative wine, The Road to Burgundy is a glorious celebration of finding one’s true path in life, and taking a chance—whatever the odds.